Fall is just around the corner, yaaaaaay! In case you guys didn’t know already, Fall is my favorite season! Did you know that vegetable gardens aren’t just for summer? In fact there is a hugemongous selection of fall and winter crops to be planted at the end of August or beginning of September. This is a list of my fall garden must haves. This is going to be a very video heavy post. I am a very visual learner and think videos help so much, especially for all y’all first time gardeners out there. Fall gardens might be my favorite for another reason. They are supper easy to start and maintain. You don’t have to worry about when to start your seeds indoors or when to transfer them outside. In fact you just sprinkle a few seed in the ground and cover them with dirt (direct sow). Actually most fall produce does better with the direct sowing method than starting indoors and transplanting. Then you just make sure they stay well watered and pick them when they are ready! Generally you want to plant fall garden 6-8 weeks before the first frost. To get your frost dates check out The Farmer’s Almanac Frost Date Calculator. I love the Farmer’s Almanac y’all. It is pretty much the bible of farming, if you have never heard of it/used it poke around their website or order yourself your own Almanac here. 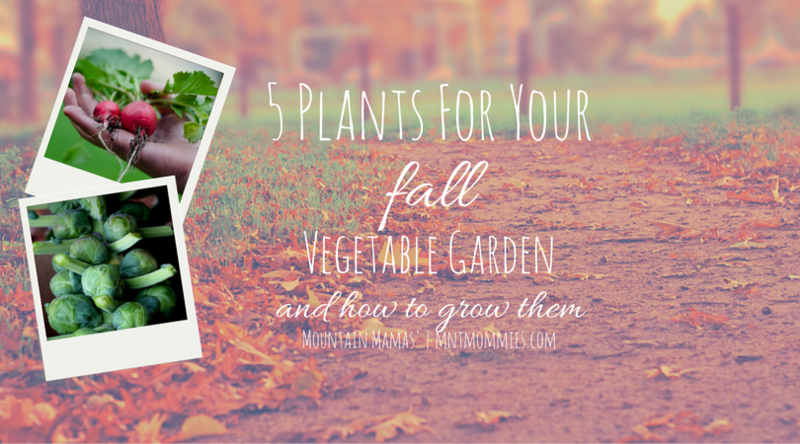 Now on to my favorite plants to grow in the fall. I love spinach, in salads, quiches, sauteed, in smoothies. Pretty much just about any way you can eat spinach. For spinach you direct sow the seeds into the ground spacing them 1-2 inches apart. I also like to mix in nitrogen rich fertilizers like cottonseed meal, blood meal, or composted manure (this is what I usually use because it is a great way for me to use all the horse poo). My favorite spinach is the heirloom Bloomsdale Longstanding Spinach. Here is a great video on how to plant spinach. And here is a video about how to harvest spinach. Planting and growing spinach is similar to many other leafy greens like swiss chard and arugala. Brussels sprouts need a bit of room. Direct sow the seeds into the ground 2 feet apart and cover them with 1/4 inch of soil. Once they have started growing you will need to trim off all the bottom leaves and use 2-3 bamboo stakes to support them. Here is a great video showing how to trim and support your growing sprouts. This is another good video showing how to harvest your sprouts. There are a number of pea varieties that you can grow in the fall. You usually want to plant them in the middle of August to give them plenty of time to grow before the first frost. This is another very versatile plant. You can eat it raw, grill them, or my favorite pickle them! The leaves are also great in salads or lightly sauteed. To grow beets make a row about 1/2 inch deep and place your seeds in a line. Cover the the row and water. If you make multiple rows space them about a foot apart. When they sprout and are around 2-3 inches tall thin your row so that all the beets are about 3 inches apart. Harvest when the beet bulb is about 2 inches in diameter. To harvest your beets just firmly grasp around the leaves right at the bulb and pull. Here is a video from Burpee on how to grow your beets. These are one of my favorites because they are super quick. They mature in about 25 days and I can usually get 2-3 crops of radishes before a solid freeze comes in and wipes out my garden. Plant seeds 1/2 inch in the ground about 1/2 to 1 inch apart. If you grow multiple rows keep the rows 1 foot apart. When the radishes reach about 2 inches tall they will need to be thinned to 1 inch apart so the radish bulbs have plenty of room to grow. I get most of my seeds from Burpee since they are non-GMO and have organic options. I prefer to buy what I can from local nurseries and feed stores and order what I can’y get in the store from the Burpee website. This entry was posted in DIY, Garden, Homestead and tagged fall, farm, farmer, farming, garden, green living, homestead, natural living, plant, sustainable, sustainable living, urban garden, urban homestead, vegetable.